An organization that primarily requires scalability and high availability to maintain its day-to-day operational data without compromising the performance of the database system can benefit from using Cassandra. This database is known for its fault tolerance and linear scalability. Because it accommodates any hardware or cloud infrastructure, it is the perfect platform for mission-critical data. Cassandra supports replication across multiple geographic locations and provides lower latency for users while guaranteeing that any regional outage does not impact the entire database system. 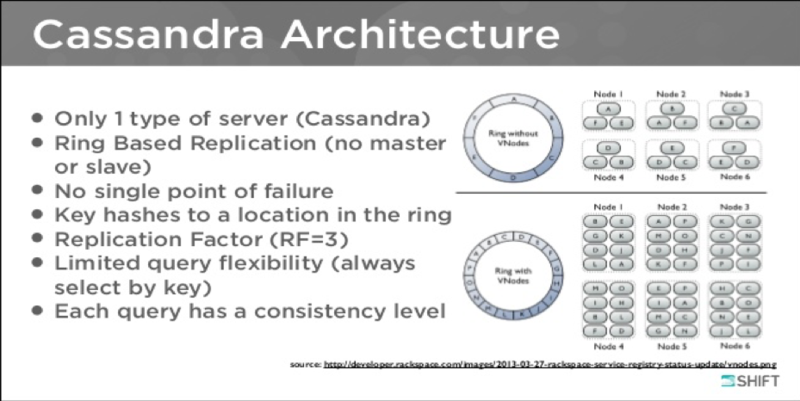 Cassandra is an open-source, distributed, and decentralized database (or storage system). It is used for managing very large amounts of structured data spread across the world. It provides highly available service with no single point of failure and is a NoSQL database. Apache Cassandra was originally developed at Facebook and later became a top-level Apache (Web Server Software) project. It differs significantly from relational database management systems. Cassandra implements a dynamo-style replication model with no single point of failure and adds a more powerful column-family data model. Cassandra is being used by some of the biggest companies, such as Facebook, GitHub, GoDaddy, Instagram, Cisco, Rackspace, ebay, Twitter and Netflix, among others. Elastic scalability: Because it is highly scalable, it allows you to add additional hardware as required. Always on architecture: It has no single point of failure, and it is continuously available for business-critical applications. Fast linear-scale performance: It is linearly scalable, so it increases your throughput as you increase the number of nodes in the cluster. Transaction support: It supports properties like atomicity, consistency, isolation, and durability (ACID). Fast writes: It was designed to run on cheap commodity hardware. Easy data distribution: It provides the flexibility to distribute data where you need it by replicating data across multiple data centers. Node: Where data is stored. Data center: A collection of related nodes. Commit log: A crash-recovery mechanism in Cassandra. Every write operation is written to the commit log. Cluster: A component that contains one or more data centers. Mem-table: A mem-table is a memory-resident data structure. Data is written to the mem-table after it is written to the commit log. For a single-column family, there might be multiple mem-tables. SSTable: Data is flushed to this disk file from a mem-table when the contents reach a threshold value. Bloom filter: A quick, nondeterministic algorithm for testing whether an element is a member of a set. Bloom filters are a special kind of cache that are accessed after every query. Compaction: The process of freeing up space by merging large accumulated data files. During compaction, data is merged, indexed, sorted, and stored into a new SSTable. Compaction also reduces the number of required seek operations. Setup ssh for all cluster nodes. Set PATH and JAVA HOME in ~/.bashrc file. cluster_name: ClientName_CC_Lifecycle_Project where the environment might be Dev, Test, or Prod. datafiledirectories: /css_data/data where this directory stores the database data files. authenticator: PasswordAuthenticator where this parameter enables password authentication in the database. Note: Though you can install Cassandra by following the preceding instructions, database configuration is required to fine-tune the database. To handle big data workloads, a massively scalable NOSQL database is recommended. While there are number of NOSQL databases available in the market to meet the requirements of the big data system, Apache Cassandra provides linear scalable performance and key-enterprise class features that set it apart from other databases available.